What Gary Wyatt from Autodesk said about the people on the production line at modular home factories is so true. 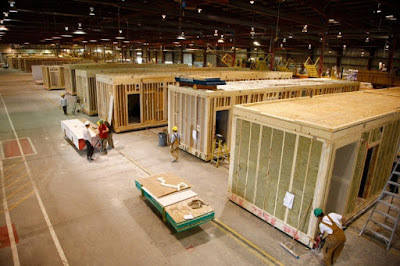 I have been in the construction industry for over 30 years and compared to the labor on site built homes, the labor found in a modular factory is much superior. Many production line people are long term employees having been on the job for decades while their equivalent in the field tend to view pounding nails in the heat, rain and cold as a laborer a temporary job at best. Gary Wyatt, Autodesk director of building design, cited several factors that have made modular more popular. The primary one is the skilled labor shortage that has hit construction markets worldwide in the past few years, making it difficult for contractors to hire enough workers. According to Wyatt, modular home construction means that more of the skilled work is done at the beginning of the building process, allowing designers to leave detailed instructions on how the modules should be put together. His equating the building process to that of Ikea or Lego is completely understandable. By producing the volumetric module in a factory using skilled and trained people and then having it shipped to the jobsite where lower skilled labor can assemble it on the jobsite, although not something new, means that the labor shortage normally found in an entire site built home or hotel project can be shifted to the end of the project. Mr Wyatt, you’ve said more in a shorter amount of words about the value and promise of modular than anyone I know. Thank you! I agree. Thank you for your observation on the future of construction. As an educated consumer I agree totally that skilled trades and production line teams succeed due to institutional knowledge and are more skilled than their counter parts in the field. Actually it was the production line team that convinced my wife that modular was the right choice. Cost doesn’t equal Market, which is a long standing principle in real estate appraisal. In building our last home using modular we were 30% higher in cost than the equivalent site built home through direct comparison and after two appraisals were able to secure funding for only 60% of the actual cost. The second issue we encountered was one you mentioned in a different light in your article; “By using offsite fabrication processes, you can have much lower-skilled people be able to actually construct these buildings,” he said. If we had stopped at the point where the home was set on the foundation and we had finished the home ourselves we would have saved time, money and would not have encountered sloppy work from those “much lower skilled people”. Systems built homes are the way of the future, without question. Appraisers and Funding Sources need to be educated on modular construction as well as factories need to produce homes that compete with site built homes. Interior design using higher end products are 1000% better than they were 20 years ago however basic exterior elevations still resemble manufactured homes in most factory catalogs and appraisers are picking up on this differences. Those that have improved elevations have a cost factor that in many cases are prohibitive when compared to site built. In this area of Virginia many modular builders have returned to site built as their primary building method given they couldn’t compete using modular. Custom modular builders are different than infield affordable home builders, as true custom modular have continued to thrive. For the record I am not a contractor however I have 34 years in analyzing real estate sales as such what I am reporting are regional results and no way are an indicator of the entire market. We would definitely build using modular construction in the future however that doesn’t change the cost factors, appraisal issues, and lack of training for set and finish crews. I will close with the two questions I ask our builder; It took approximately 2 weeks to build 85% of our home in a factory why did it take 12 months to finish the reaming 15% and secondly given they always present multiple homes in the Louisville Manufactured Home Show, Would they show our home in the show given the condition they left it in and why do they think that is ok to show at 100+% and sell at 85% minus. Just a consumers opinion, nothing else.